Even though this blog is about Mining Technology, sometimes it’s good to showcase efforts that go beyond mining, particularly for a good cause. On Thursday, August 16th, the Denver Maptek office sent an I-Site representative, armed with an 8800 LiDAR scanner, to Jack Swigert Aerospace Academy in Colorado Springs, CO. This District 11 public school is in a unique position of being host to the Space Foundation’s Discovery Institute, a facility designed to promote education in space exploration through hands-on learning. 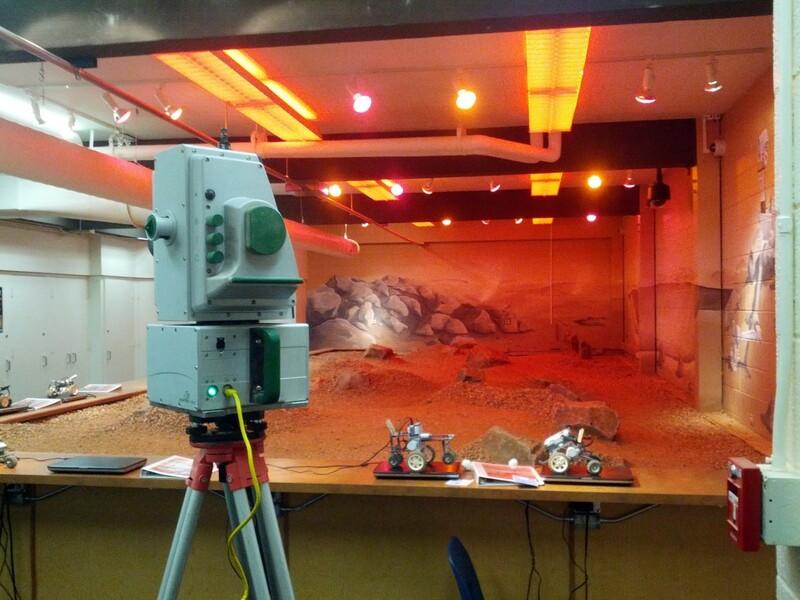 One of the features of the Discovery Institute is the Mars Yard, a simulated Martian landscape where students can program and operate robotic “rovers” to learn about practical aspects of math, engineering, and programming. 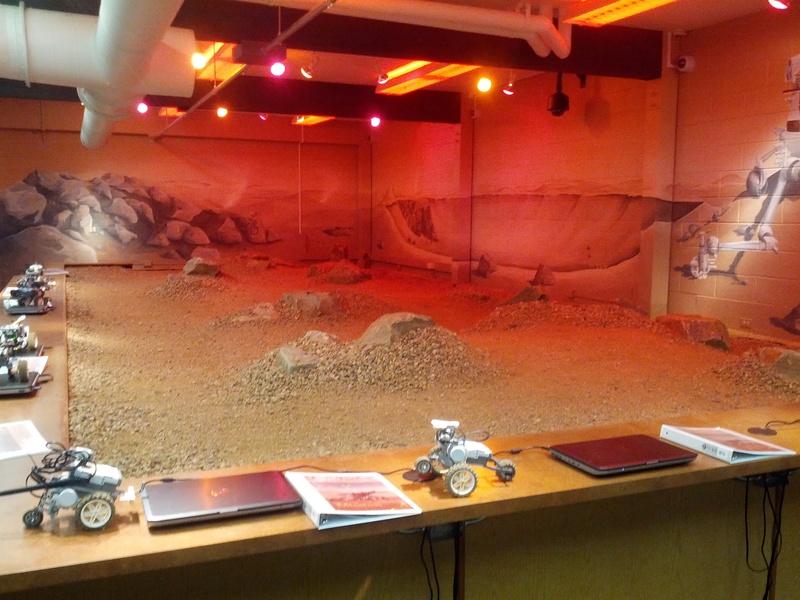 Students can drive the rovers across the “martian” landscape by programming with the available laptop computers. The Discovery Institute, in conjunction with the recent successful landing of the Curiosity Rover earlier this month, is planning to integrate a geologic aspect into the Mars Yard. An artificial “geologic model” of the subsurface is going to be designed such that the students can explore below the surface just as they explore the landscape itself. 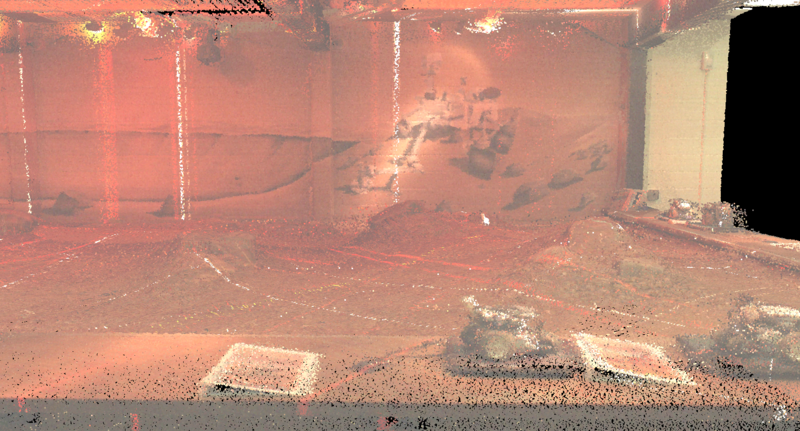 7 total scans were taken to minimize shadowing behind rocks and objects. The total time on-site was about 1.5 hours, and a couple of additional hours of post-processing were all that were necessary for some really great results. 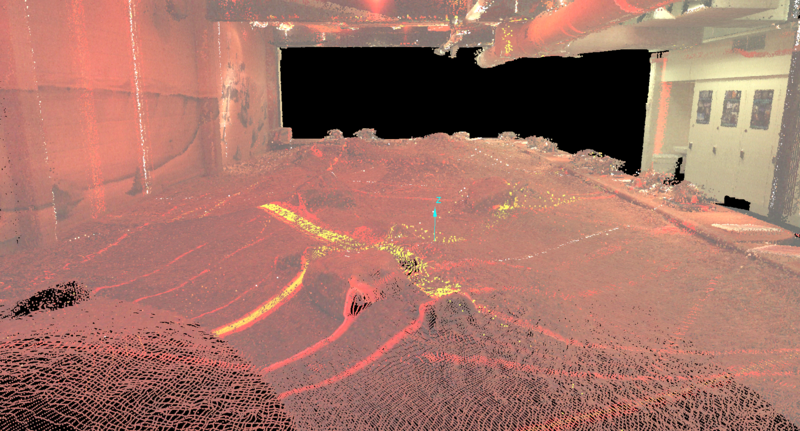 Scan results of the Mars Yard once the scan data was merged together to form a cohesive 3d environment. The ‘rover” is visible in the foreground. The scans from a similar angle to the first photo of this post, notice the people in the background! The scans from the back-wall perspective looking out into the room. 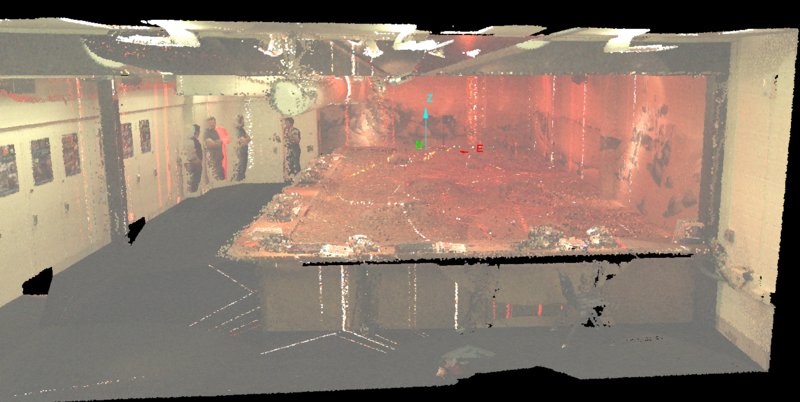 Here is a video of the scans assembled and spinning in 3D, but the color rendering did not work well (software incompatibility?) so it’s not as good as seeing the live points in I-Site. Thanks go out to Maptek for donating their time and resources to this fun project, and to the Space Foundation for planning a great learning project for the students!